“It’s hot. It’s loud. Goddamn this mariachi band to hell!” I thought to myself while waiting on the New York City subway platform. My mind sought separation from my body. They couldn’t stand to be together. And so I put on my headphones and scrolled through Instagram until, gradually, my consciousness was taken somewhere else — somewhere better. New Yorkers love Instagram. 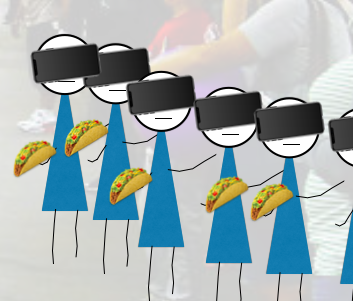 I love tacos and thought my drawings might too. I sometimes wonder, if you live in New York City, but 95% of the time you are on Instagram — are you ever really in New York City? Sure the body is in New York, but that magic alchemy of human sensation that infuses you with awareness, and empathy, is overridden by technology. The present is programmed, with my consent, by whoever writes the app du jour. It reminds me of the type of tourist who counts airport layovers on their “countries visited” list. 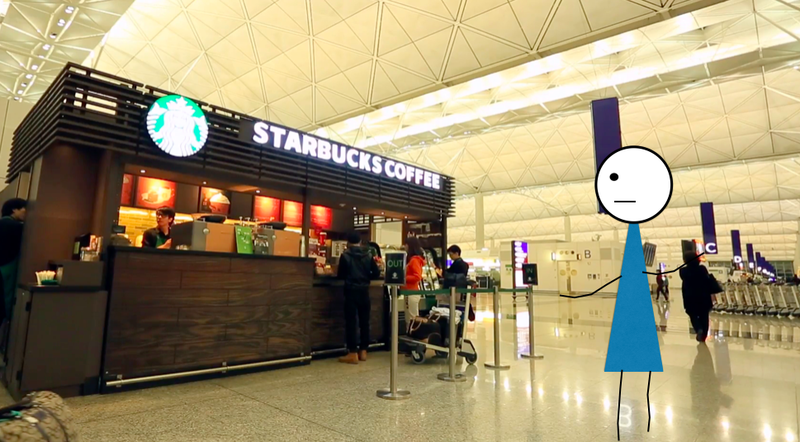 If your body was temporarily in the Hong Kong airport — does it mean you’ve been to Hong Kong? Ah… so this is what Hong Kong is like. Humans have six inputs through which we receive information. We call these senses and they are sight, hearing, smell, taste, touch, and thought. I think “I’m going to be late for work.” (I feel helpless). Overriding our senses is a form of control. We adjust our environment so that we can adjust the feelings going on inside of us. It’s kind of a wonderful superpower if you think about it — knowing that at any moment, given the right tools, you can override your situation. But sometimes I feel like my consciousness has become a black box with six levers that I’m constantly switching on and off to distract me from the thoughts inside. 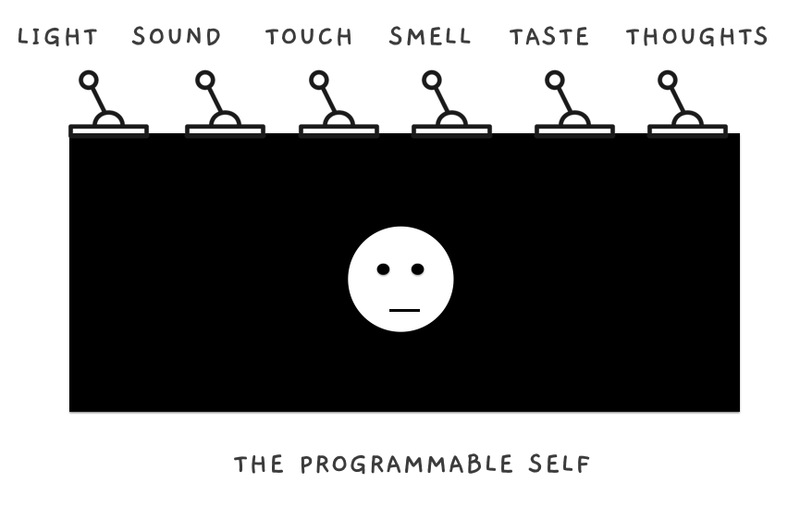 I call it the Programmable Self. Through the Programmable Self, the present moment becomes a fully automated experience: When I want to hide I can put on my headphones, look at my phone, and mask my inputs. Wherever I go, there I am not. The problem with living in a state of sensory override is that one is never present. We give up the ability to respond to the world around us. And responsibility is just that: possessing the ability to respond. In Jane Jacobs’ seminal work, The Death and Life of Great American Cities, she observed the important role human senses play in maintaining peace in communities. One of her main arguments is that there is less crime in places where there are people watching each other. Her book came out in the 1960s, but it’s just as relevant today as it was then. 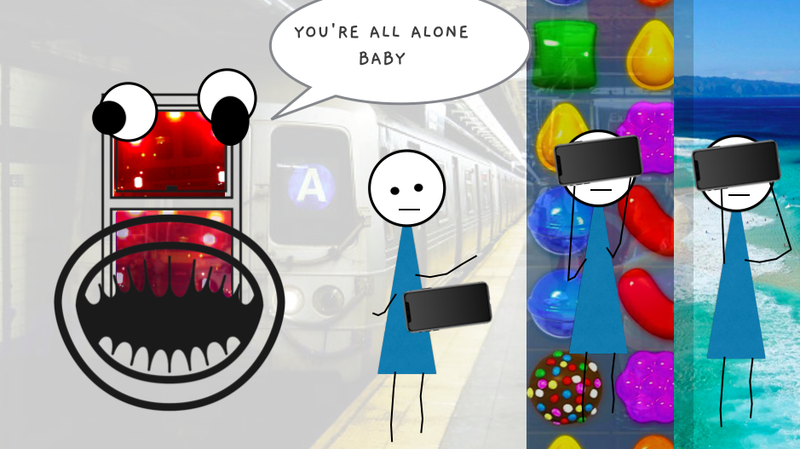 Horrifying public crimes can, and do, occur in well-lighted subway stations when no effective eyes are present. They virtually never occur in darkened theaters where many people and eyes are present. […] Without effective eyes to see, does a light cast a light? Not for practical purposes. If my Programmable Self is streaming YouTube videos of Hawaii, and the person next to me is Crushing Candy. Then who is watching out for our bodies? If a human body falls onto the subway, and no one is there to hear it does it make a sound? One of our responsibilities as members of any community is to watch out for our neighbors, whether they live next door or stand uncomfortably close to us on the train. In certain US states it’s the law to assist others in need! But life doesn’t always play out that way. Genovese syndrome is the social phenomenon in which individuals are less likely to help a victim if they believe other people are present. The phrase comes from the 1964 Kitty Genovese murder in which 37 people reported witnessing the murder after it had happened, but not one of them called the police when it was actually happening! Not one person. Today, it’s possible that 37 people could even be in the same subway car as a murder, but there wouldn’t be any witnesses because everyone had taken themselves somewhere else. Not very practical for the upkeep of a safe community. 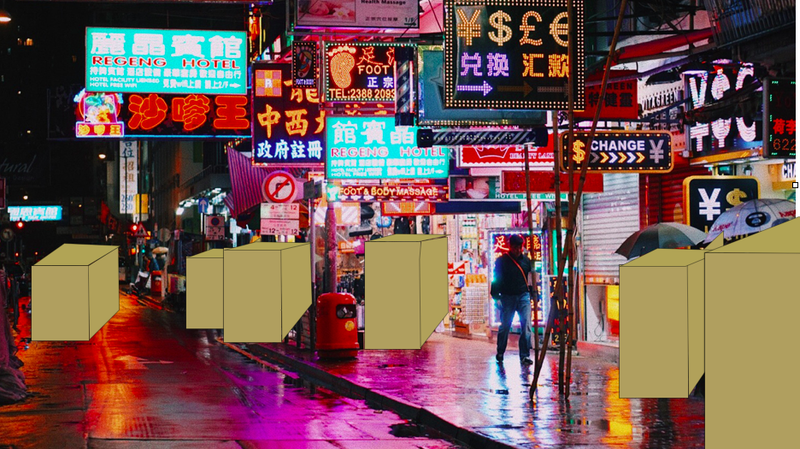 Seven people on the street, six are in boxes. You’re all alone baby! When we override our senses we’re abstaining from social responsibly. We will ourselves into blindness and, much like the tourist transferring flights at the Hong Kong airport, we are insulated from the responsibility of interacting with world outside that building. As long as Instagram and Bob Dylan are in your pocket, you’re never more than two steps away from your own autonomous bubble. All this is nice, but as I stated early: there are times when I’m on the subway platform, when it’s loud, hot, and doggone, it’s so uncomfortable! Times when I dread the present moment and am consumed with, “I don’t want to be here! Which leaves me with a choice: I can choose to endure the present moment to the benefit of those around me. Or I can do what feels nice and hope someone else is paying attention. Or to say it another way, I can choose to live as a citizen, or as a tourist. Thanks to Pippa Biddle for reading early drafts and providing countless insights. Additional support comes from One Month: Learn to code in 30 Days. If my feeling is homesick? Return a new feeling to my brain. The Programmable Self was originally published in Hacker Noon on Medium, where people are continuing the conversation by highlighting and responding to this story.